As I use PowerPoint 2016 for Mac, the word that keeps popping into my head is pleasant. Nearly everything about the massive visual overhaul from the previous version (PowerPoint 2011 for Mac ) seems clearer, friendlier, and more modern. It feels more like Apple’s Keynote, which I mean as a compliment. The feature changes are mostly minor and subtle yet useful. Even so, PowerPoint 2016 for Mac still lags behind its Windows counterpart—and it also lost a few interesting features that were present in PowerPoint 2011. The most obvious change is a nicely redesigned ribbon, which is now nearly identical to the ones in PowerPoint for Windows and PowerPoint Online. If you knew where everything was in PowerPoint 2011, prepare for a bit of relearning. Almost every ribbon control is still there, but many have been moved, renamed, and given new icons. The erstwhile Themes tab is now called Design; Tables, Charts, and SmartArt (among other features) have been subsumed under a new Insert tab, and a number of tabs (such as Picture Format and Table Design) appear only when the appropriate object type is selected. Each built-in theme has several variants; if you want even more control, choose your own color palette, font, or background. The entire toolbar is gone, with only four vestigial icons (for File, Save, Undo, and Repeat) next to the Close, Minimize, and Zoom controls. Although most toolbar icons have been relocated onto one of the ribbon tabs (and also have corresponding menu commands), you can no longer create a customized set of icons for your most common tasks. A new sidebar (much like Keynote’s Inspector) appears on the right side of the window when you invoke certain features, such as the Animation pane (which lists all the animations on your slide), the Format Pane (for editing the attributes of shapes, graphics, and other objects—including such previously hard-to-reach settings such as 3D Format and 3D Rotation), and Comments. Each pane gets its own tab, and you can tear off any tab to make it a floating palette. I like the way this context-sensitive interface consolidation (along with the streamlined ribbon) reduces screen clutter. When you open PowerPoint 2016, you’re presented with 24 brand-new themes. Although that’s less than half the number of themes in PowerPoint 2011, there’s a new twist: each theme has numerous variants. With one click, you can select a different combination of color palettes, fonts, and background styles for your current theme (but with the same overall design); or you can apply those attributes individually. Although the theme chooser displays no templates (basically fill-in-the-blanks presentations, each with its own theme), you can type a keyword in the Search All Templates field at the top to display matching templates, which you can then download with two clicks. Another noteworthy improvement is better integration with OneDrive and Office 365. Presentations are now saved to your OneDrive by default, and if you want to use OneDrive for storing and syncing your data, it couldn’t be easier. Unfortunately, unlike PowerPoint for iOS, the Mac version doesn’t have native support for Dropbox, iCloud Drive, or other cloud storage services (although you can manually save a file to any folder on your Mac, including Dropbox and iCloud Drive). 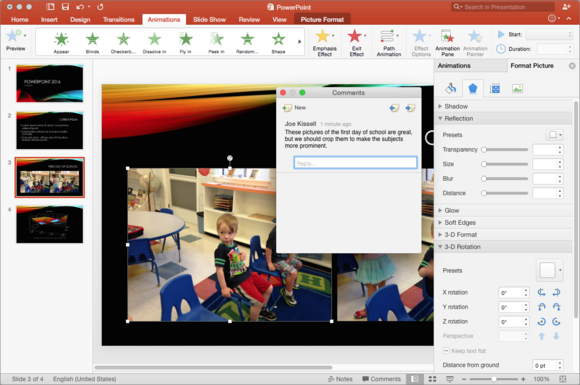 Sharing presentations (with or without editing privileges) is much simpler now too, and even someone without a copy of PowerPoint can view and edit your shared presentation in PowerPoint Online. And people collaborating on a presentation will appreciate the new threaded comments feature. Other minor new features include a more flexible presenter view, better conflict resolution (for when multiple people make changes to a slide at the same time), and a dozen or so new transitions (matching those in the Windows version). Panes such as Animations and Format Picture appear, as needed, in a sidebar at the right, giving you easier access to many features. You can tear off any of these (such as Comments) to make it a floating palette. A number of features disappeared, too. The Help mentions only one of these: you can no longer save a presentation as a movie (you can work around this by using screen-recording software such as ScreenFlow). In addition, you can broadcast your slides live using the PowerPoint Broadcast Service, compare two versions of a presentation, or use the Scrapbook to store and reuse text and graphics snippets. 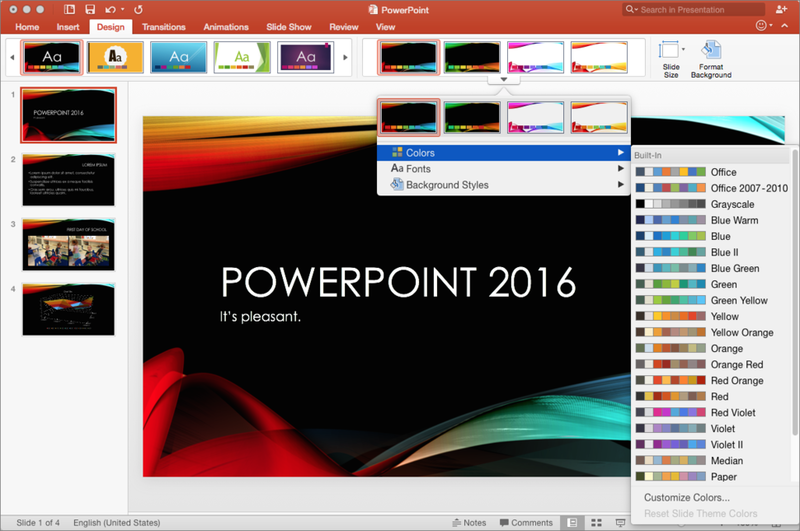 Macworld’s review of PowerPoint 2011 lamented the absence of features found in the Windows version, such as the capability to adjust the starting and ending points of movies, sounds that play in the background across slides, and an advanced timeline for editing a slide’s animations in a graphical format. Those features are still absent in PowerPoint 2016 for Mac. Other Windows-only features are embedding YouTube videos; trimming, bookmarking, and fading audio; customizable keyboard shortcuts; animation triggers (animating an object when you click it); inserting online pictures from within PowerPoint; and embedding fonts in your presentation (for proper display on computers without the same fonts). For Mac users, the more apt question is how PowerPoint stacks up against Apple’s free Keynote app. When I reviewed Keynote 6.0, I complained about features that had been lost in its most recent overhaul; since then (it’s now up to version 6.5.3), some of those features have been restored, and its reliability has improved. I now consider the two apps equivalent in usability, overall power, and likability. However, each has features the other lacks, so your choice will depend on which features are most important to you (and which ecosystem—OneDrive/Office 365 or iCloud/iWork—you feel most comfortable in). For example, PowerPoint has nothing like Keynote’s signature Magic Move transition, its tables lack Keynote’s extensive spreadsheet capabilities, and Keynote (still) lets you trim audio and video and save your presentation as a movie. On the other hand, PowerPoint offers easier and more flexible path animation, the fabulously useful Arrange > Reorder Overlapping Objects command (for a 3D view of all the objects on a slide), and the option to play presentations in a separate window (which is especially useful when giving remote presentations using an app such as Skype). PowerPoint 2016 for Mac is, as I say, pleasant to use, not to mention powerful. If it had feature parity with the Windows version, Dropbox and iCloud support, and a Magic Move-like transition, it would be nearly perfect—and I’d love to see that happen. Editor's note: Updated one 8/3/15 to correct information about the ability to export presentations as a series of graphics. PowerPoint for Mac 2016 is powerful and pleasant to use. Whether you should use it over Keynote depends on the features you need.